Over the last couple of years, the ultra-compact form factor (UCFF) has emerged as one of the bright spots in the troubled PC market. Kickstarted by Intel's NUC (Next Unit of Computing) designs, it has been successfully cloned by other vendors such as GIGABYTE (BRIX), Zotac (C-series nano) and ASRock (Beebox). 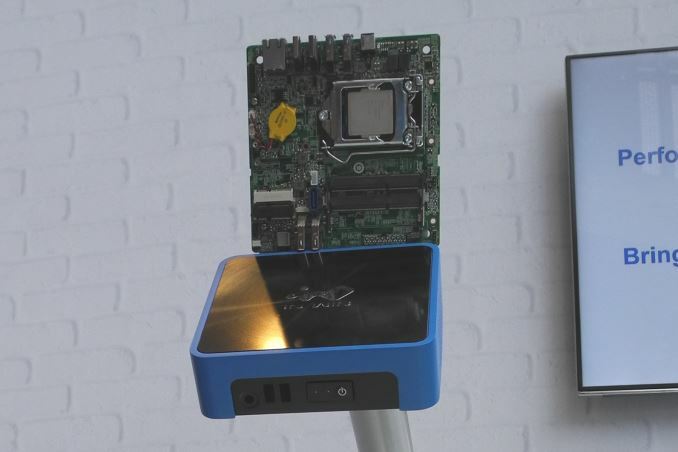 With platform performance increasing every generation, and performance requirements getting tempered by the rise of the not-so-powerful smartphones and tablets, Intel could pack a heavy punch with their 102x102mm NUC motherboards. Atom-based units (using Bay Trail) could provide very good performance for most users. Intel tried to shrink the PC even further by releasing a Compute Stick based on the Bay Trail Atom Z series SoCs earlier this year. ECS, with their LIVA designs, has adopted the Mini Lake reference design for their UCFF PCs. All of these UCFF PCs come with BGA CPUs / SoCs. The configurability aspect is minimal from an end-user's perspective. Looking at the mini-ITX form factor immediately leads us to a hole in the mini-PC lineup between it and the NUC. At IDF last week, Intel quietly launched the new 5x5 motherboard form factor. Coming in at 147x140mm, it is closer to the NUC in the fact that it can operate directly off DC power and takes SODIMM memory. Approaching from the mini-ITX side gives us the LGA socket for a Core processor. Unfortunately, at this size, we have to make do without the full length PCIe slot. 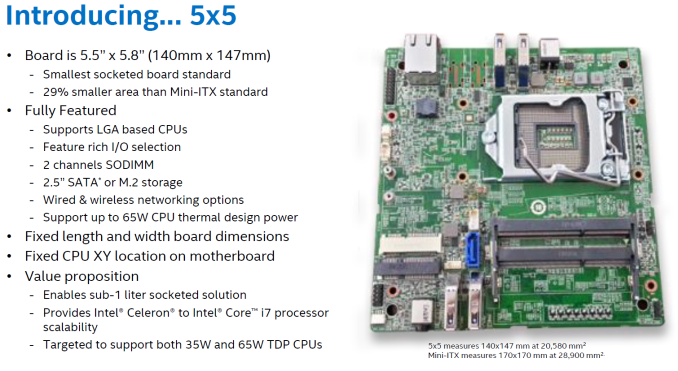 Intel suggests that solutions using the 5x5 boards could come in with a 39mm height for a volume of 0.89L (when using M.2 drives and a heat sink suitable for 35W TDP CPUs). 65W TDP CPUs and 2.5" drive support would obviously increase the height requirements. Many usage areas which required custom-sized embedded boards (such as digital signage / point of sale terminals / kiosks etc.) have now opened up for the PC, thanks to the NUC and other similar form factors that were introduced over the last year or so. The new 5x5 form factor ensures that a mini-PC is available for every size and performance requirement. As of now, it looks like In-Win has a chassis design ready for the new form factor. We are awaiting more information on the board(s) and availability details. this is obviously gonna help sell those iris pro sku's and edram sku's with 72 EU's. pretty neat but i thought intel was trying to move away from socket-able cpu's. socket cpu's tend to produce more heat as well.. i can see some newbie putting a 6770k in a chassis that's meant for 35w. At 30% smaller, that might sound like a lot, but it really isn't much smaller than ITX and the sacrifices are substantial for those extra millimeters. would be plenty of room on the board for at least a 4x PCIe slot. It does make sense. It's not always a pci-e 1x slot, it's often a full pci-e 16x slot. You can make a pretty nice and compact gaming machine based on mini itx, it won't be possible with this one until we can finally get external GPUs straight. Of course if you don't care about gaming or don't have needs for an internal pcie slot it does not make sense.